An antigen is any substance that may be specifically bound by an antibody molecule or T cell receptor. Antibodies can recognize as antigens almost every kind of biologic molecule, including simple intermediary metabolites, sugars, lipids, autacoids, and hormones, as well as macromolecules such as complex carbohydrates, phospholipids, nucleic acids, and proteins. This is in contrast to T cells, which mainly recognize peptides. Although all antigens are recognized by specific lymphocytes or by antibodies, only some antigens are capable of activating lymphocytes. Molecules that stimulate immune responses are called immunogens. Macromolecules are effective at stimulating B lymphocytes to initiate humoral immune responses because B cell activation requires the bringing together (cross-linking) of multiple antigen receptors. Small chemicals, such as dinitrophenol, may bind to antibodies and are therefore antigens but they cannot activate B cells on their own (i.e., they are not immunogenic). To generate antibodies specific for such small chemicals, immunologists commonly attach multiple copies of the small molecules to a protein or polysaccharide before immunization. In these cases, the small chemical is called a hapten, and the large molecule to which it is conjugated is called a carrier. The hapten-carrier complex, unlike free hapten, can act as an immunogen. Figure 1. Antigen presentation on B cells to helper T cells. The term hapten (half antigen) was introduced in the 1920s by Karl Landsteiner to define low molecular weight chemical reagents which, as such, will not induce immune responses. However, immune responses to haptenated macromolecular carriers (proteins) lead to the production of hapten-specific antibodies and T lymphocytes. Even though free hapten fails to induce antibody production, hapten-reactive antibodies bind to free hapten as well as to carrier-coupled hapten. The free hapten molecules, therefore, compete for antibody bound to hapten-carrier conjugates. Once bound to protein carriers, haptens form antigenic determinants that may activate the antigen receptors of B lymphocytes as well as of T lymphocytes. Haptens, such as dinitrophenol, are small chemicals that can be bound by specific antibodies but are not immunogenic by themselves. If, however, haptens are coupled to proteins, which serve as carriers, the conjugates are able to induce antibody responses against the haptens. There are three important characteristics of anti-hapten antibody responses to hapten-protein conjugates. First, such responses require both hapten-specific B cells and protein (carrier)–specific helper T cells. Second, to stimulate a response, the hapten and carrier portions have to be physically linked and cannot be administered separately. Third, the interaction is class II MHC restricted, that is, the helper T cells cooperate only with B lymphocytes that express class II MHC molecules that are identical to those that were involved in the initial activation of naïve T cells by dendritic cells. All of these features of antibody responses to hapten-protein conjugates can be explained by the antigen-presenting functions of B lymphocytes. 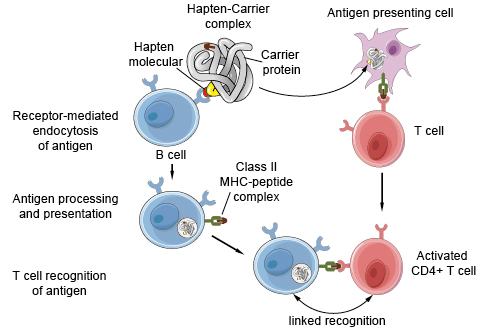 Hapten-specific B cells bind the antigen through the hapten determinant, endocytose the hapten-carrier conjugate, and present peptides derived from the carrier protein to carrier-specific helper T lymphocytes (see Figure. 1). Thus, the two cooperating lymphocytes recognize different epitopes of the same complex antigen. The hapten is responsible for efficient internalization of the carrier protein into the B cell, which explains why hapten and carrier must be physically linked. The requirement for MHC-associated antigen presentation for T cell activation accounts for the MHC restriction of T cell–B cell interactions. The characteristics of humoral responses elucidated for hapten-carrier conjugates apply to all protein antigens in which one intrinsic determinant, usually a native conformational determinant, is recognized by B cells (and is therefore analogous to the hapten) and another determinant in the form of a class II MHC–associated linear peptide, is recognized by helper T cells (and is analogous to the carrier that is the source of the peptide). The hapten-carrier effect is the basis for the development of conjugate vaccines, which contain carbohydrate epitopes recognized by B cells attached to proteins recognized by T cells. KLH (keyhole limpet hemocyanin) is a copper-containing protein that is found in arthropods and mollusca. Therefore, it is an ideal carrier to use in mammalian hosts such as rabbits and mice. It is isolated from Megathura crenulata, and has a molecular weight that ranges from 4.5 × 105 to 1.3 × 107 Da. KLH is the carrier that is used most commonly because it has a higher immunogenicity than does BSA. However, its solubility in water is limited because of its size and structure, which results in a flocculent appearance. The turbidity does not affect immunogenicity, and the resulting solution can be used for successful immunizations. BSA (bovine serum albumin) is a plasma protein in cattle that is one of the most stable and soluble albumins available. It has a molecular weight of 67 × 103 Da, and includes 59 lysines. Of these, ~30–35 are accessible for use in linker conjugation, and so BSA is a popular carrier protein for weakly antigenic compounds. BSA is more water-soluble than KLH because it is smaller; therefore, it is used more commonly in immunoassays. However, because BSA is commonly used to block nonspecific binding sites in antibody-based assays, BSA conjugates should not be used for immunization if the end-point assay system uses BSA. This is because if antisera against peptide-BSA conjugates are used in these assays, false positives are common because the sera used also contain antibodies against BSA. OVA (ovalbumin) is a protein isolated from hen egg whites. It has a molecular weight of 45 × 103 Da. It is often used as a second carrier protein to confirm that antibodies are specific for the Hapten rather than the carrier protein.